Mined by the Egyptians in Sinai more than 6,000 years ago, turquoise and imitations of it have been discovered in graves from around 4000 BC. It is the stone of horsemen, warning them of danger, and will prevent horses from stumbling if placed in a saddle or on a bridle. So it is the stone of all travellers, especially those who travel far by air or sea. In modern times, a small turquoise can be attached to pets' collars and to the mirrors of birdcages to protect them. It can also be plaited into horses' manes to prevent their being stolen or harmed, using the following method. 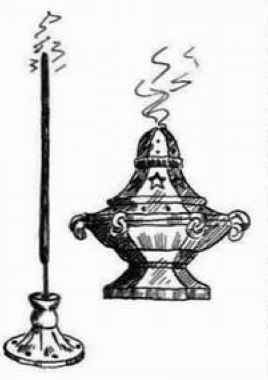 Soak the turquoise in sacred water for 24 hours, then charge it with power by sprinkling salt on it and passing it through the smoke of a powerful incense such as cedar, then through the flame of a pink candle and finally with the sacred water. Finally, bind the turquoise with three hairs from the animal. Turquoise is a power stone and is good in global rituals, to protect persecuted groups and for healing the sea and air. It is particularly effective in whale and dolphin conservation work.